Elmbank accommodation is situated at Spittal, just two miles from Berwick on the opposite bank of the Tweed, at the mouth of the river. The Berwick upon Tweed self catering properties, Beach View and Island View, are newly renovated, with great taste, an d are equipped to the highest standard. They have spectacular views out over the sea towards Bamburgh, Holy Island, and Berwick. Beach View is a ground floor apartment, which has disabled access and facilities. Island View which is a stunning four bed roomed house, with every comfort including a Jacuzzi, and beautiful gardens. Both properties are beautifully decorated, and offer everything you need to enjoy a fabulous Berwick upon Tweed self catering holiday. 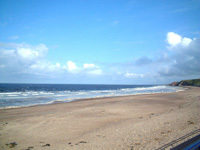 The Northumberland coastline is a World Heritage site, and has many unspoilt golden sandy beaches, majestic castles, and areas of special interest. The holy island of Lindisfarne is but a few miles from Berwick upon Tweed and is separated from the mainland by a tidal causeway. Bamburgh Castle, once the seat of the kings of Northumberland, and Alnwick Castle famous for the Harry Potter films, are just a few miles away. Trout and salmon fishing on the river Tweed is always a favourite with anglers, and there are many other out door pursuits also available, such as; walking, sea angling, cycling, horse riding, quad biking, climbing, swimming, beach volleyball, and clay pigeon shooting. Northumberland has many wildlife sanctuaries for birds and seals. Take a boat trip to the Farne Islands and see the seals and nesting birds up close. Northumberland has been both part of Scotland and England in its time, and since 1482 it has been part of England. Currently the Border lies just north of Berwick upon Tweed. This beautiful market town is filled with history and charm, from the Elizabethan fortifications to the colony of swans, which grace its river mouth. 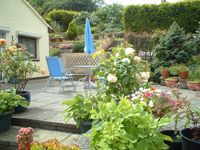 The owners of Elmbank, Berwick upon Tweed self catering accommodation, Sharon and Kevin Richards and their daughters invite you to relax in comfort, and enjoy your stay in these fantastic holiday homes. 2009 sees the bright start of their Berwick upon Tweed self-catering accommodation business. Beach View and Island View are next door to each other, and can accommodate large groups, or two families on holiday together. Smoking is not permitted inside the premises. Pets are welcome at Island view prior to arrangement.